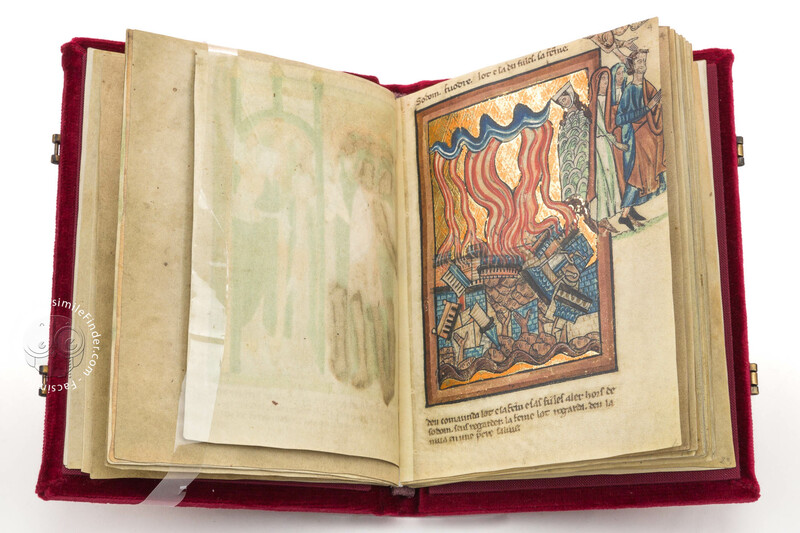 Whilst medieval book painting is a rich and plentiful art, the names of most of its painters remain hidden in the mists of time. One exception to this rule, however, is the life and works of an artist who was active in 13th-century Oxford, named William de Brailes. 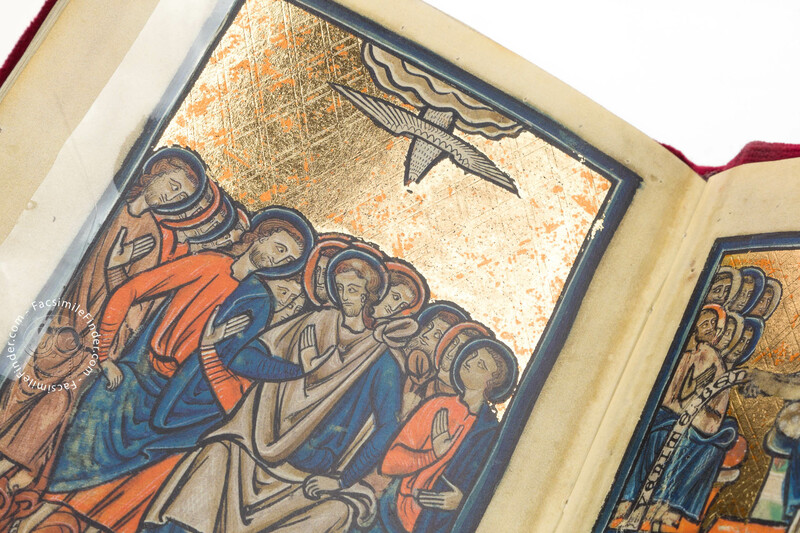 De Brailes created the most fascinating Oxford Bible pictures, a richly illuminated cycle of Bible scenes whose formal vocabulary the artist in part newly invented himself. 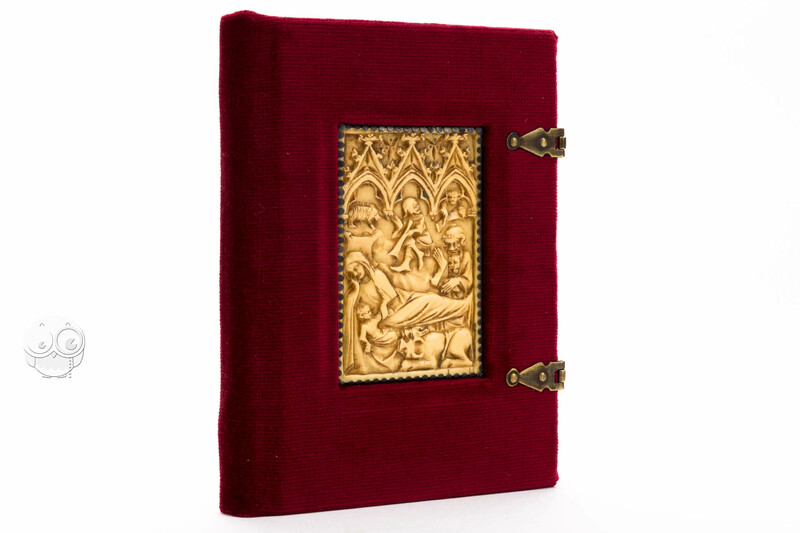 Each of the 31 folios in the format of c. 13.5 x 10 cm is copiously decorated with gold, frequently with finely tooled gold. What makes De Brailes an outstanding personality among the masters of early Gothic art is not only the fact that we know his name; his highly characteristic and lively style, which sometimes even indicates a satirical note, equally accounts for the unique position he holds among his peers. Inventiveness and originality were the basic elements of William de Brailes' lively depictions with a narrative force that still impresses us today. 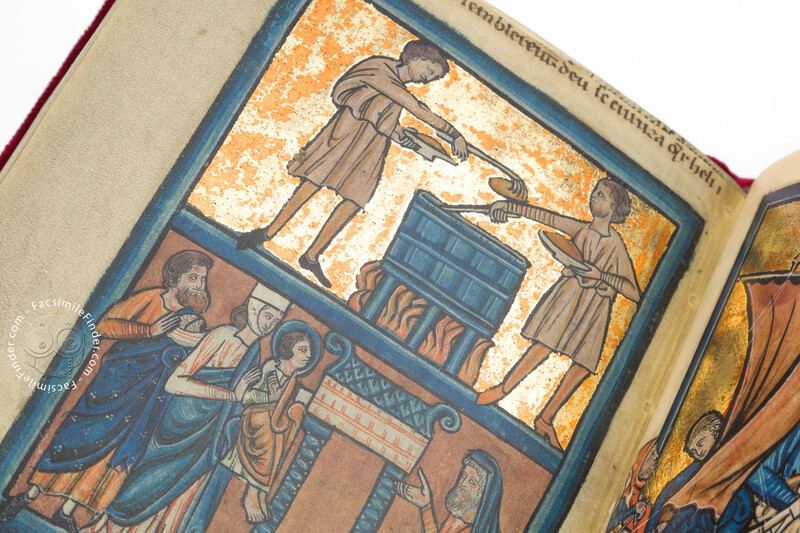 In the Oxford Bible pictures, he presented his customer with a sumptuous picture cycle that must have met the contemporary taste for Gothic art in every possible way. The drapery was rendered three-dimensionally using black and white outlines; equally skillful was the artist at enhancing the vertical line thanks to a clear-cut composition of his scenes and slim figures; and each miniature shines with the exuberance of burnished gold. 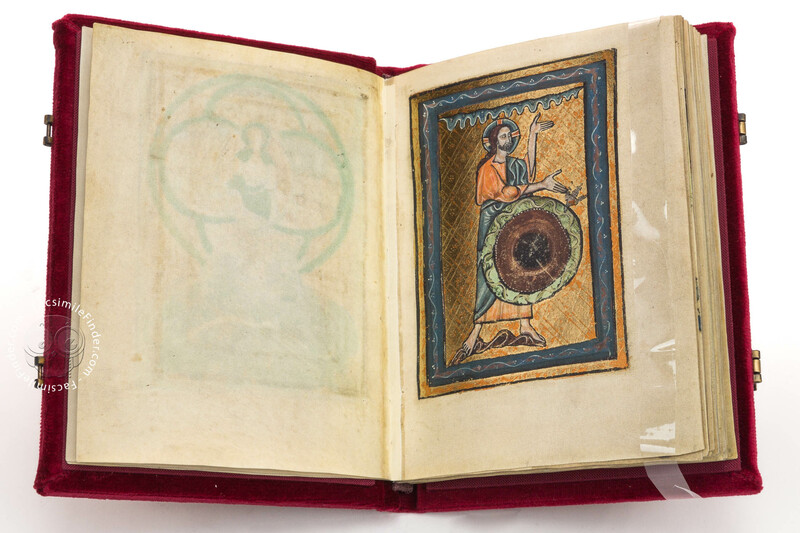 The person who commissioned the Oxford Bible pictures obviously spared no expense for the adequate decoration of this illustrated cycle. Master William de Brailes thus found himself in a position where he was able to set each individual miniature on a ground of polished gold leaf. 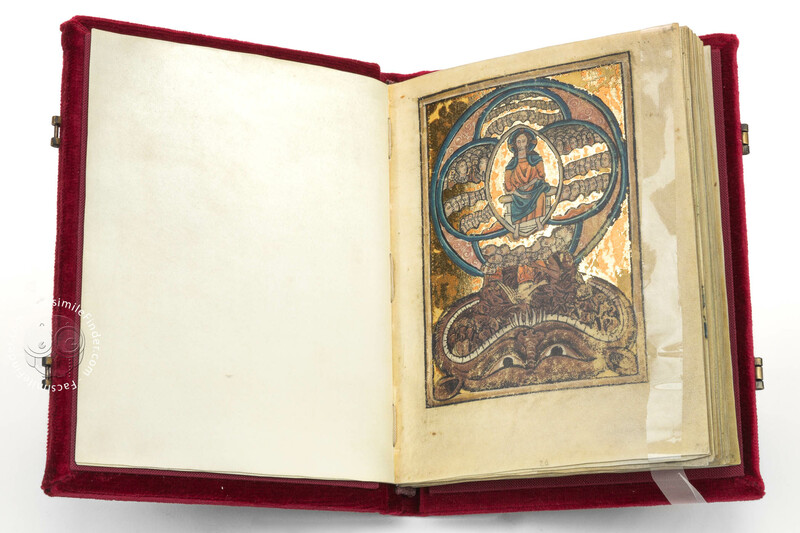 Its glowing luxury has come down to us in a perfect state and makes this jewel of book painting a true collector's dream. 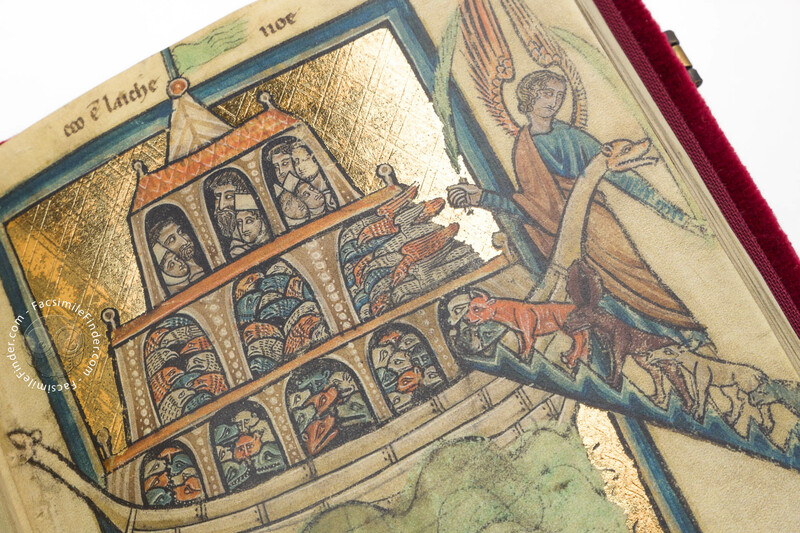 Moreover, the golden grounds underline the significance of each of the depicted Bible scenes. The lavishly gilded grounds were eventually enlivened in a final stage of chiseling, where the gold was embossed with fine lozenges and dots or scalelike superposed semi-circles, using special tools. In the Oxford Bible pictures, the carefully applied chiseling ideally complements the artistic momentum De Brailes confers on the individual settings. Who could afford such a richly decorated cycle of miniatures? The identity of the person for whom these precious miniatures were made has remained a mystery to this day. 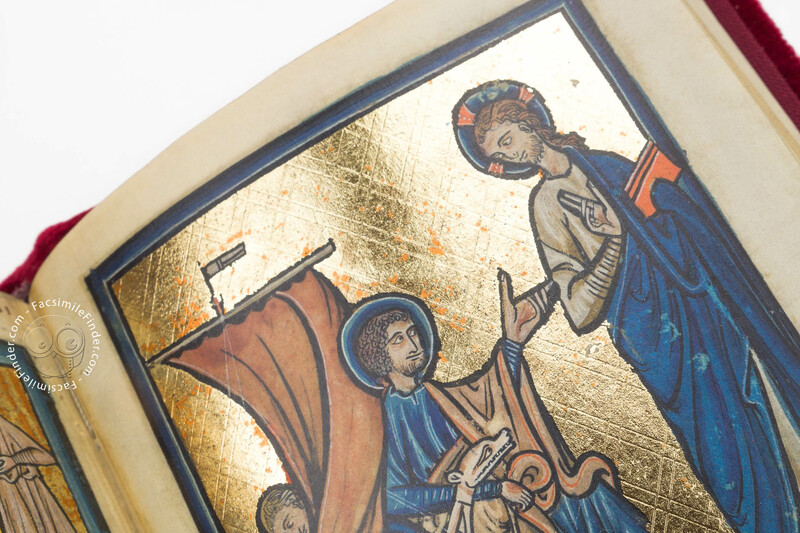 The growing need for books of private devotion in the 13th century, however, underpins the assumption that the donor might have been a member of the secular nobility. One portion of these Bible miniatures emerged as late as toward the end of the 19th century when an antiquary in Paris purchased 31 folios. Seven leaves were sold to the Wildenstein Collection and eventually bequeathed to the Musée Marmottan in Paris. 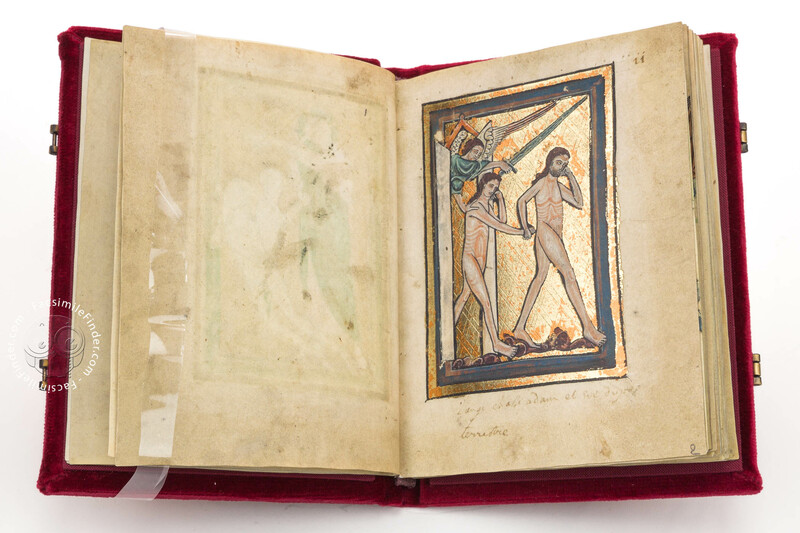 The rest of 24 leaves remained in the possession of the dealer whose love for this gem of book art found its due expression in that he had it bound in a very distinctive binding of noble red velvet, which constitutes a unique item in the history of art. He further decorated it with a Gothic ivory plate, finely carved on both sides, which he had set in a recess on the front cover. Henry Walters, the founder of the Walters Art Museum, purchased the precious work for his museum library. It was then several decades until the original miniatures were ascribed to the Oxford master William de Brailes. 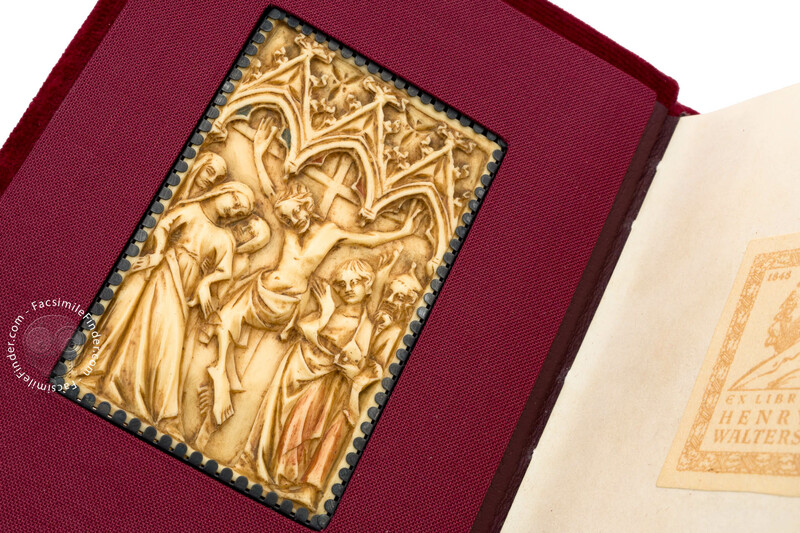 The binding of the Oxford Bible pictures is unique in the history of the book, as the front cover is set with an ivory plate that was carved on both sides. This work of art constitutes a masterpiece of Gothic sculpture. The ultra-fine plate in the format of 8 x 5 cm is decorated on both sides with scenes of the life of Christ: The artist showed the Nativity on the front and the Crucifixion on the back of the plate. The extreme vividness of the depicted scenes, however, conceals how extremely thin the plate actually is. In some places, the artifact is so fine that the light shimmers through! 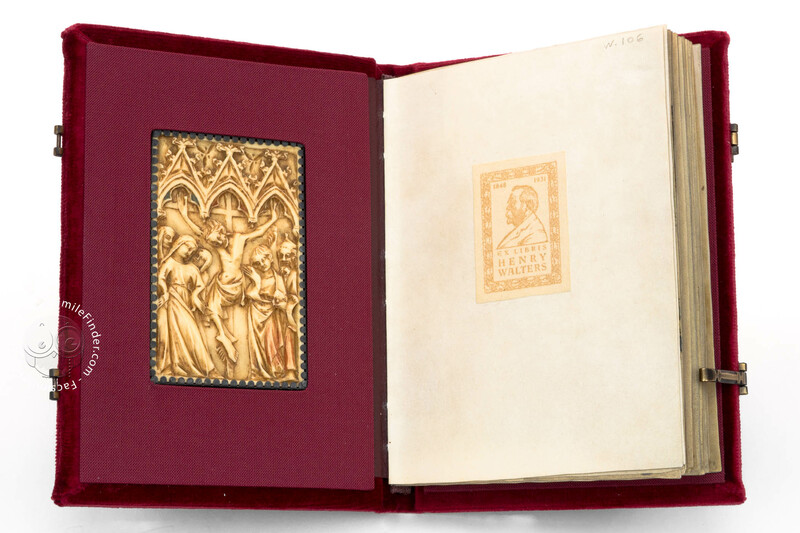 There is no other book with a similar binding in the history of art. Neither has the original function of the fragile plate been brought to light as yet. What we know for certain is the place and date of its creation: the plate was produced in the last quarter of the 14th century in Germany, in the Rhine area. 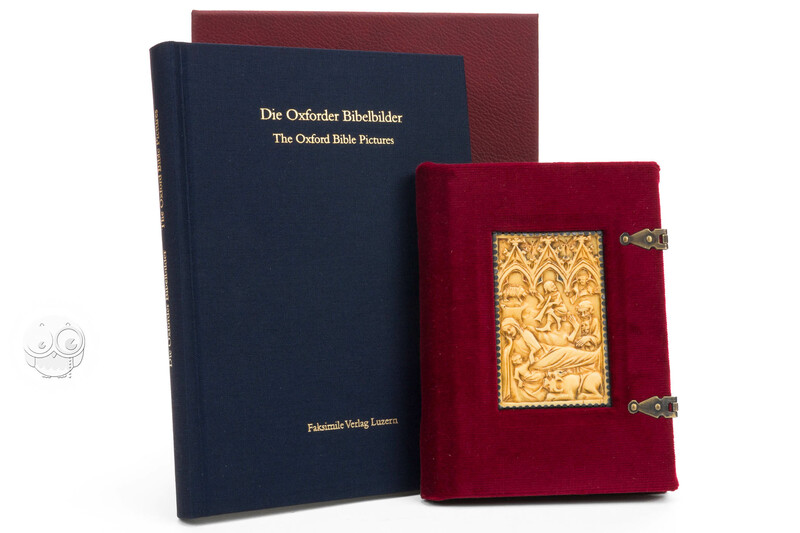 The Oxford Bible pictures thus fuse English and German Gothic art in a most creative combination. 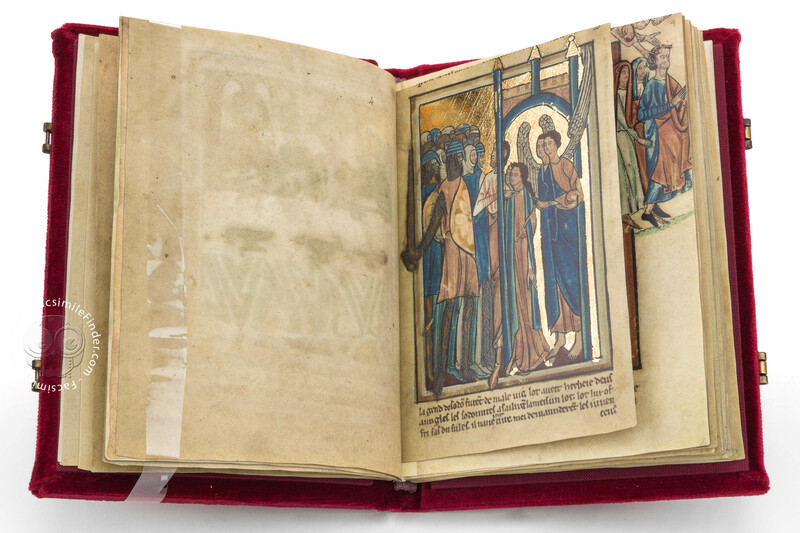 Manuscript book on parchment − 13.5 × 10 cm − 62 pp. Full-size color reproduction of one or more portions of the original document, Oxford Bible Pictures: the facsimile attempts to replicate the look-and-feel and physical features of the original document; pages are trimmed according to the original format; the binding might not be consistent with the current document binding. 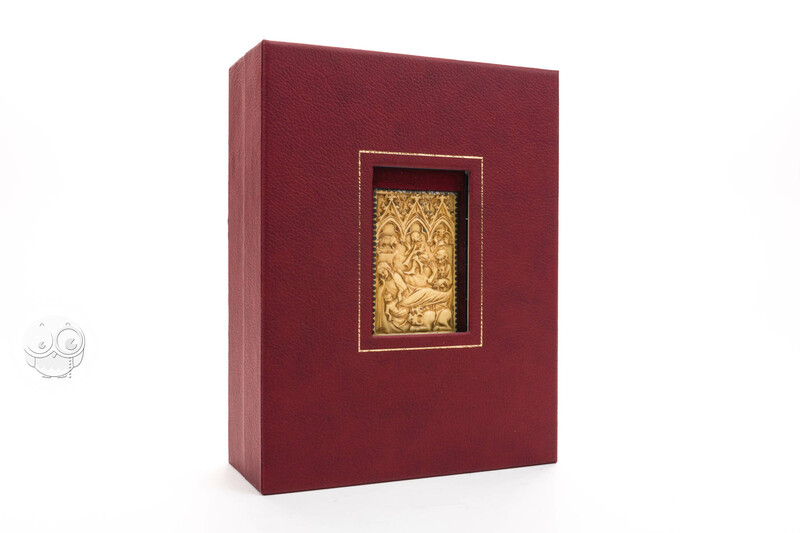 The Fine Art Facsimile edition is delivered in a hand-made leather case, set with a window of acrylic glass, in order to display the ivory replicates of the Oxford Bible pictures in an adequate manner. 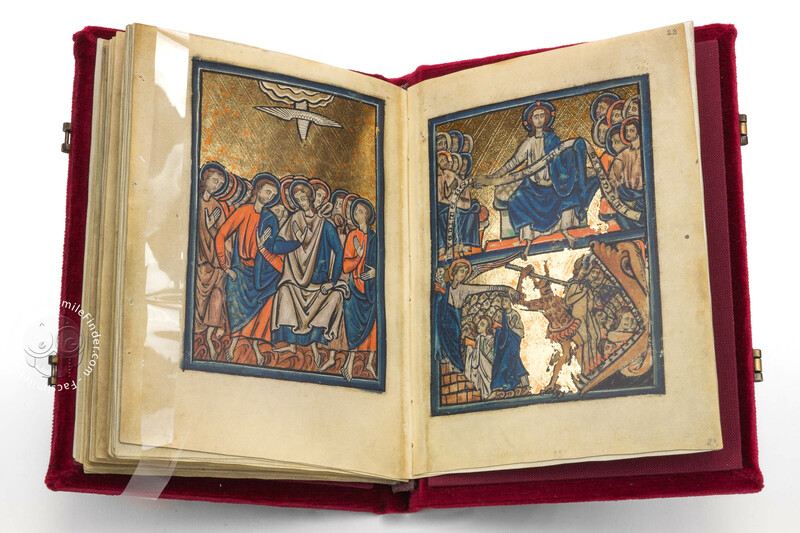 The facsimile comes in a binding that imitates the current binding, including the two-sided, carved ivory plate and the two clasps. 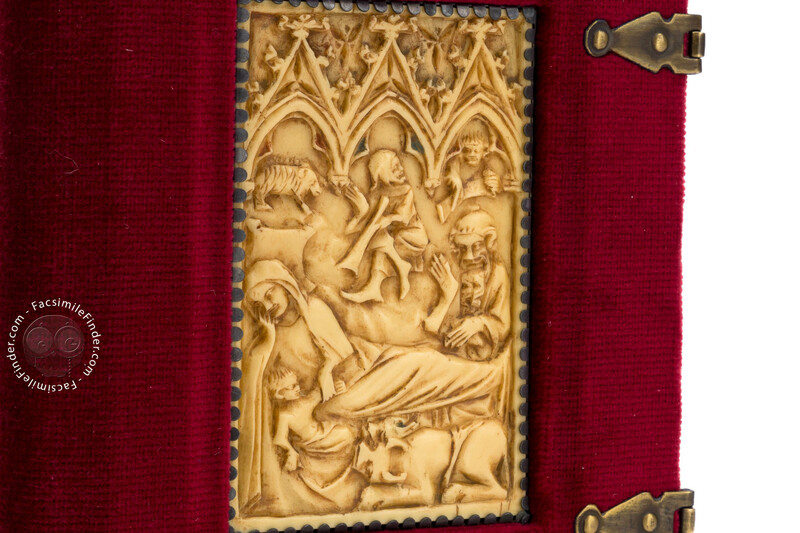 The front cover is set with a two-sided carved ivory plate, here the obverse showing the Nativity. On one bifolio de Brailes shows Israel’s Exodus to the Promised Land and Pharaoh’s Army being hurled into the Red Sea.